Often when I come across my old artwork, I giggle. Other times I hang my head in shame. 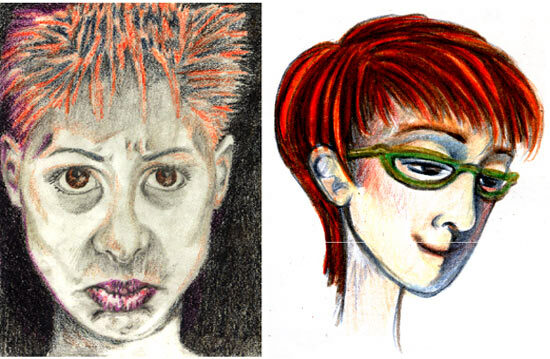 Occasionally I think, wow, that's pretty good, as with these three self-portraits from the good ol' 90s. The left-side portrait was done around 1995, when I graduated art school and entered the working design world. (No wonder I look so stressed.) The right-side portrait is from 1998, shortly after I moved to San Francisco, wearing my amazing green La Fonte glasses. This self-portrait is circa 1993, when I was still in art school. It was my first project using Adobe Illustrator, or maybe Macromedia Freehand back then, and I loved the freedom of vector tools once I groked them.